Radiomatic® photon: Safe working with camera assistance. Positioning a gripper arm precisely over the load, driving a logistic vehicle through areas with limited view, or applying a drill bit exactly at the desired position in narrow spaces: Our new camera assistance radiomatic® photon is a valuable help for such demanding tasks. Radiomatic® photon delivers live video images to the radio control’s color display. The operator always has a good view on the machine and the working environment even in areas with limited view and dead spots. Radiomatic® photon comes with an interface for many cameras made by Orlaco. Depending on the application, cameras with different viewing angles can be used as well as infrared cameras for use in low light conditions or even in darkness. Radiomatic® photon is available for spectrum E, spectrum D (in preparation) and as an option for technos B (in preparation). Compact. Handy. And a real powerhouse. The renowned micron family by HBC-radiomatic gains a new member: micron M features a compact design, has great ergonomic handling and scores with many powerful features – such as the new merlin® technology.No matter if you control a belt conveyor, a high rack or a lifting platform: micron M ensures maximum safety for man and machine, makes work a lot easier and has a lot of power. The built-in Li-ion battery provides the power needed for up to 30 hours of continuous operation. The transmitter is charged inductively with a Quick Charger, which is also used to store the transmitter. Pure operating comfort with configurable color TFTs. A smart and ergonomic design with high-performing displays and Li-ion exchange batteries: those are the trademarks of our new radio controls technos A and technos B. These two innovations complement the proven technos series by HBC-radiomatic and score with a whole set of useful HBC features – for example the front panel lighting, an integrated flashlight and merlin® TUC (Transmitter User Card). Depending on your requirements, both transmitters are available with joysticks or linear levers as well as diverse other HBC operating elements. This leaves nothing to be desired! The new generation of HBC joysticks has arrived! For more than 30 years HBC’s full-metal joysticks have been setting industry standards. These premium operating elements developed and manufactured by HBC stand for perfect precision and ideal operating comfort in rugged quality. Available now, our classic has been updated to a more innovative and superior design. Lighter and smaller than the previous version = 25 % less weight! The renowned quadrix Ex handheld transmitter by HBC-radiomatic is now certified according to NEC 500 / 505. This compact, intrinsically safe transmitter is now approved for use in Class I, Division 1, Groups C and D hazardous locations as well as Class I, Zone 0, Group IIB hazardous locations in North America. Also certified according to ATEX for the use in Ex zones 1, 2, 21, 22 as well as Underground in Europe, quadrix Ex is ideal for the most demanding oil and gas applications across the globe that require the highest level of safety. The quadrix Ex’s ergonomic and light weight design allows for easy and comfortable handling over long periods of time. Additionally, its comprehensive safety features and configuration options allows for a wide range of possible applications in the lifting and conveying industry. As standard, this transmitter comes equipped with 8 two-step push-buttons and two powerful rechargeable NiMH batteries, allowing up to 12 hours of continuous operation. 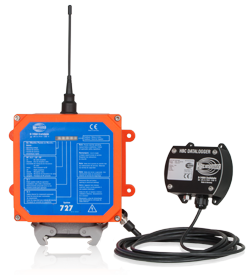 Additionally, radiomatic® iLOG is incorporated into the quadrix Ex transmitter. This easily accessible electronic key allows for the quick activation of a backup transmitter in the event the primary unit is damaged. This is accomplished without the trouble or safety risks involved with field programmers or internal chips. This quick activation also allows the operator to continue working without downtime, saving valuable time and money. quadrix Ex is available with a whole range of HBC Smart Options – such as radiomatic® report. This innovative option allows for only authorized personnel to operate the remote and can simultaneously collect detailed operational data of the radio control. Another useful feature is LED feedback. Depending on the configuration of the control, the operator can be informed about errors and warnings such as an impending crane overload. For additional operator safety in specific working situations, quadrix Ex is available with radiomatic® shock-off and radiomatic® zero-g. These intelligent safety features can automatically deactivate the system if the control is dropped, thrown, or takes an impact, preventing the unintended activation of crane or machine functions. Further useful functions are the trolley pre-selection for cranes with two trolleys as well as the tandem operation of two cranes. With these functions, exceptionally long or bulky loads can be safely and comfortably transported over long distances. The revolutionary HBC operating concept! radiomatic® pilot: this name stands for a completely new, revolutionary HBC operating concept! With this major innovation, you can easily and intuitively control machine and crane functions by hand movements! This is accomplished by means of an integrated inclination function. This ground-breaking innovation in combination with a newly developed HBC Micro Joystick allows for the control of 4 steppless, single- or two-step drives by horizontal and / or vertical inclination of the transmitter. 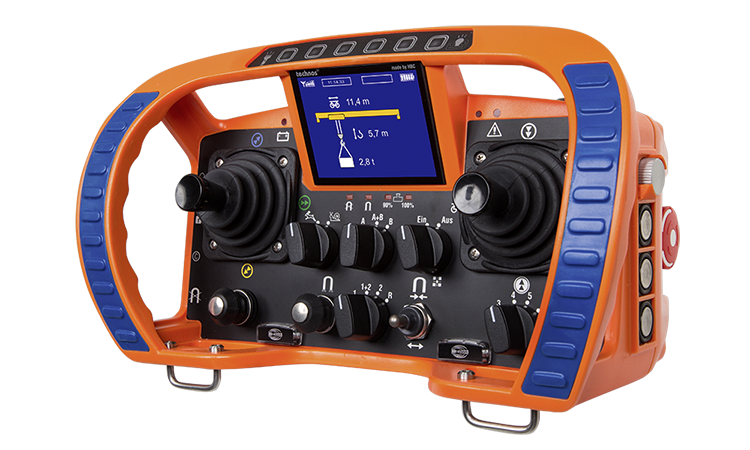 This makes radiomatic® pilot a high-performing, intuitive single-hand control for diverse areas of application! With radiomatic® pilot, you can for example have a crane hoist precisely follow the movements of your hand upwards or downwards, easily maneuver a vehicle to the left or to the right with your wrist, or control the speed of a belt conveyor with a smooth movement – the possibilities are unlimited! 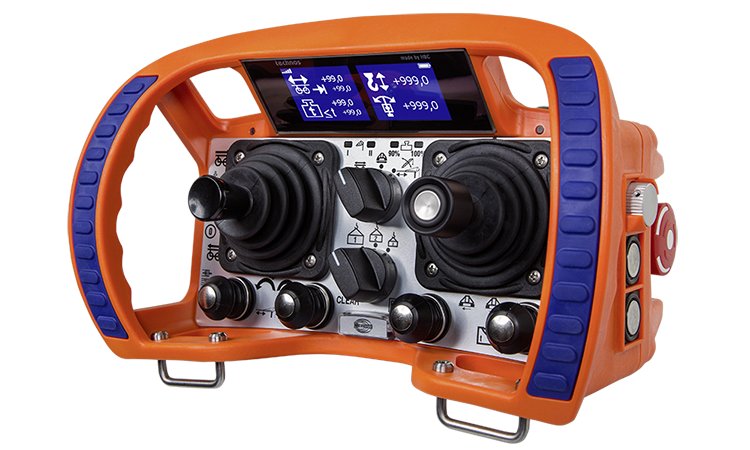 An innovative, extremely ergonomic hand-held transmitter design. An inclination function with: 2 axes (single-/two-step or analog). A release button for the inclination function. A newly developed HBC micro joystick with 2 axes (single-/two-step or analog). 4 single-step push buttons (partially with rotary switch functionality). A vibration alarm and a signal tone for the indication of the battery status as well as the activation of the inclination function. In 2013 Vacon Truck Tour through Europe was organised. The Vacon Truck had also arrived in Latvia with the innovative Vacon truck exhibition, where the industry professionals presented the latest technological developments, advances and descoveries in AC drives sphere. Useful operational data conveniently at hand. With the new HBC data logger you can collect diverse operational data of the radio control exact to the second, for example how long the system was in use or how long specific drive commands have been operated. You thus always have a whole set of useful information at hand that can for example be used to schedule service work or to calculate costs if you rent out machines.